The internet-radio company reported a lackluster quarter, complete with disappointing guidance. Shares of internet-radio company Pandora (NYSE:P) tumbled 20.9% in October, according to data provided by S&P Global Market Intelligence. An analyst downgrade and a disappointing third-quarter report were responsible for much of the decline. Shares of Pandora soared roughly 60% from the beginning of April to the beginning of October, despite a string of mixed quarterly reports. Speculation about the company's consideration of strategic alternatives drove some of the gains, but no new news on that front has emerged since. Given that run, any bad news was liable to send the stock tumbling. 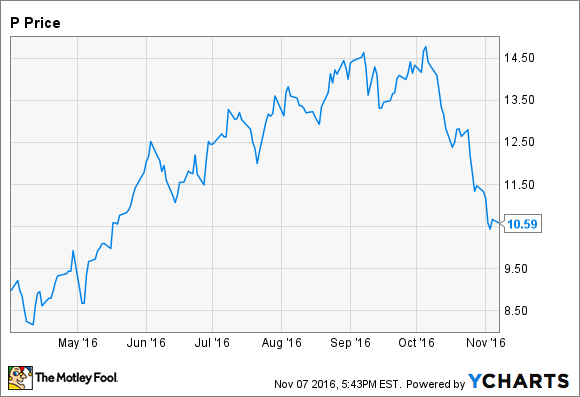 On Oct. 17, Bank of America downgraded the stock to sell, slapping on a pessimistic $9 price target. The BofA analyst argued that acquisition speculation was supporting the stock instead of the fundamentals, and that it would be difficult for Pandora to hit its growth targets given the competitive landscape. The stock dropped on the news. Pandora reported its third-quarter results on Oct. 25, missing analyst estimates for both revenue and earnings. The number of active listeners was 77.9 million during the quarter, down from 78.1 million in the prior-year period. Pandora's guidance was also disappointing. The company expects fourth-quarter revenue between $362 million and $374 million, well below analyst expectations of $391.7 million. For the full year, while analysts were expecting revenue of $1.4 billion, Pandora now expects to deliver between $1.354 billion and $1.366 billion. Massive net losses are expected to continue. Pandora is planning to launch an on-demand streaming service called Pandora Premium in an effort to compete with a growing number of similar services. The company hopes to reach 11.3 million subscribers by 2020, partly by targeting Pandora users who subscribe to a different on-demand service. With Pandora's user base in decline, the company's current strategy clearly isn't working. The move to on-demand may bring in new users, but it's unclear what advantage Pandora has over competitors like Spotify and Apple Music. Pandora is extremely late to the on-demand party, and its inability to keep costs under control and turn a profit in the past gives me little reason to believe in the company's future.